Nobody was playing Monday on the courts at West Albany High School, which will give way to the planned new performing arts center. 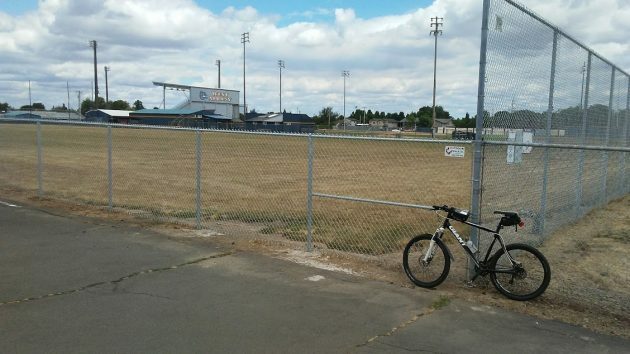 Two things I noticed right away about the planned addition to West Albany High School: The tennis courts will have to move, and there’s no perimeter fence like the one planned at South. Greater Albany Public Schools has submitted plans for the West addition to the Albany Planning Division, and the city mailed notices to property owners within 300 feet of the school, asking for comment by July 12. The project will add 101,900 square feet of building space on the south side of the school. This includes a theater, an auxiliary gym, classrooms, a new main entrance, and three new parking loops, one for buses, one for students’ vehicles, and one for visitors and others. Some parking will be lost but more will be added for a total of 429 spaces, an increase of 70 spaces or 4 percent. This is supposed to be enough so that about half of the people with cars can find a place to park. (The plan envisions 1,620 or more occupants — students and staff — of whom about 870 would need a parking space.) The plan also calls for 32 new bike parking spaces, 22 of them covered. Twenty-nine uncovered space would remain. The four tennis courts at West will be moved south to 24th Avenue S.W. There’s a vacant grassy spot there, just east of Liberty Elementary School. At South Albany High, where the school district is also planning a major renovation and addition, the plans call for a perimeter fence with electronically controlled gates to let buses through. No such fence is shown in the plans for West. That’s because unlike South with its many buildings and people moving about in the open among them, West is a more contained complex of connected structures. That’s the explanation I got from Russ Allen, the GAPS business director. Allen told me estimators are working up what the West project may cost. Construction bids will be sought in about six months. This is the spot picked for West’s four tennis courts. Looking northeast from Liberty School. Meanwhile at South, the plan to add a gymnasium and classrooms, plus the 8-foot-high perimeter fence, suffered a setback when the school board on June 4 rejected all three bids as too high. The project had been estimated to cost around $9 million, and all three bids came in at more than $12 million. The district will call for new bids in the fall, when contractors might be less busy than they have been lately. The reason for the perimeter fence at SAHS is for security. The campus has many buildings with open space between them. Students, and others, can enter and exit the campus without going through a secured access point. This is a HUGE problem that probably wasn’t envisioned in the 1970’s. My understanding with WAHS is that the buildings will be joined with interior halls – much more secure. A chain-link fence, or any other similar fence merely gives the appearance of security. It provides no actual safety benefits, it’s easy to climb or cut through. 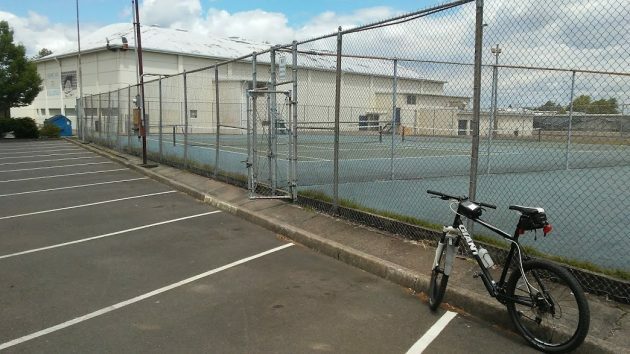 No person who wants access to the school grounds would be deterred by such a thing. It’s nonsense. RL, I am totally with you on the prison look. Definitely seems like making schools take on the appearance and feel of correctional facilities is a step in the wrong direction for citizens of a free country. Schools are the foundation of society. Do not shortchange the future. Thanks for keeping us up on the school construction plans. The newspaper is too busy trying to survive with too few people to keep on top of all this. Again, thanks. The school board will be busy this summer with more Bond/Construction projects, plus a hearing regarding Supt. Golden and complaints that were received. That happens in July. I don’t have any stake in the SAHS fencing decision – my kids don’t go there and I don’t live nearby. However, if they did, I would want a secure campus. Perhaps cyclone fencing isn’t attractive. But maybe it can be used until a future date when the buildings can be joined or nicer fencing used. We know what a risk there is with the open campus from the fire there 3 years ago. The late Ann (Ficq) Hawke told me about duck hunting in the swamp that is now the school complex including the Lutheran Church block on the corner of Queen and Elm. Her father was the community’s first optomistrist and her brother became an elementary school teacher. She also said the area was used for late summer grazing by a dairy farmer who lived at Elm and Fifth SW. It will be interesting to see if the WAHS construction project managers have any issues with that swampy land as they enlarge the school complex. Addition to West?!? The bond I voted for was advertised as full replacement of West, meaning a whole new school. Now it is scaled back to addition to the old building? What can possibly be the reasoning, especially when they can build a brand new elementary on the south side and a full replacement of an elementary in North? Just to ask for more money once they spend this current bond on other schools and rebranding South’s mascot? This isn’t right, bait and switch after bond has passed. If reporting is correct and West only receives an addition rather than full scale replacement then I will be actively campaigning against future School bonds, they can make due with tax money. The bond publicity (still available on the GAPS website) described the West project as Phase 1 of replacing and rebuilding the school. The project adds a commons, an auditorium and performing arts classrooms, eight regular classrooms, and eight classrooms for vocational and technical programs. If I recall correctly, the plan is to build the West High School expansion to eventually replace part of the current aging structure. The idea being to use up each building all the way until they can’t be maintained effectively, such as West’s main building has become. So if this is intended to be phase one of the full school replacement, then this should be reported as such. Not as an addition, which makes it appear that the existing school will continue operating for years to come. Let’s not bury the intention that the school will be replaced, otherwise every other GAPS need that comes up will be given priority. After all, it didn’t seem to take long at all for the “needs” of Oak Grove to change from addition (pre-voter approval) to replacement (post approval), so I would hate to see the opposite effect at West Albany, which is where half our community sends their kids.